I have heard that there is a small group started that do LFD, anybody know who they are or have contact details? By the way there is a good group in France that do LFD, there is a link on Richard Underwoods site. Is it the LFD that was at Merriworth last year, if so the HG boys know them. I don't know if they have a website. Cheers Darren, I think they were at Swynerton this year? Hi paul .if you can call me I will give you all there details. Hi I'm John from the 20th Luftwaffe Field Division. We have not been going long, but are getting a web site together in the near future. If anyone would like to email us please feel free. The lads sans Simon at Detling on the Monday. Welcome to the 20th LFD. If you need any help with your flak - gimme a buzz. Do you have any further information on them? "Chorlitz|12.SS|": With that many mp40s i dont think anyone had a chance. "Gott Mit Uns": Your right - they were all picked off 300 meters away by riflemen. Any tips reference LFD webbing and equipment? We are also starting to do this impression so we need tips as well. We chose to use tan and water LWFeld jackets. We have mixed leather equipment (brown and black), which should be OK for past 1943 period. Here are the pictures of our unit member from yesterdays event. Any comments welcomed. What time period do you base your impression on as was thinking about portraying before 1st November 1943 and the amalgamation with Heer. 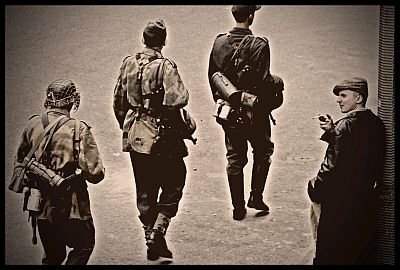 Don't know if you have seen this site of American re-enactors who do Luftwaffe Field Division in the States. Quite useful for reference though. I do Hermann Goering Division and generally wear the Splinter B Luftwaffe Field Division Jacket. One of the bests ones going is from Zeugmeisterei. Great jacket albeit pricy. Will probably get an FD impression going as well. Good luck with yours. A present we base on later period, 1944 Normandy etc., but my fellow unit memebers have a strong desire to portray LW ground units even since 1939 (early HG, Flak units). 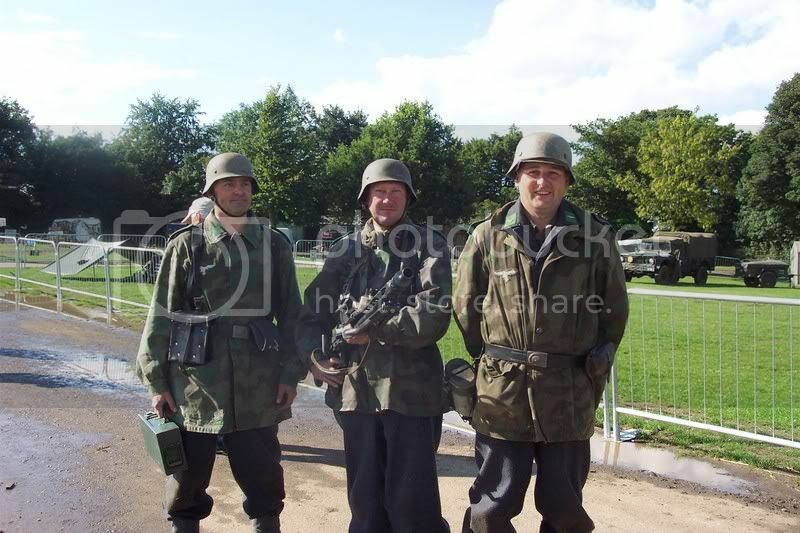 Don't know if you have seen this site of American re-enactors who do Luftwaffe Field Division in the States. Quite useful for reference though. Great site Andreas, I`m really grateful for this link ! I do Hermann Goering Division and generally wear the Splinter B Luftwaffe Field Division Jacket. One of the bests ones going is from Zeugmeisterei. Great jacket albeit pricy. As for our jackets: we would also prefer Splitter B but at the time we bought it the only alternative for us were the products of Sturm and their Splitter Tarnjacke is crappy (its not Splitter B) so tan and water jackets were the only possible solution.